6th December 2017 - BODIE 3.7 . you'll never walk alone ! What fun! He does look very much at home on a bike, doesn't he? Not to mention looking very well in biking leathers... *g* Thank you! 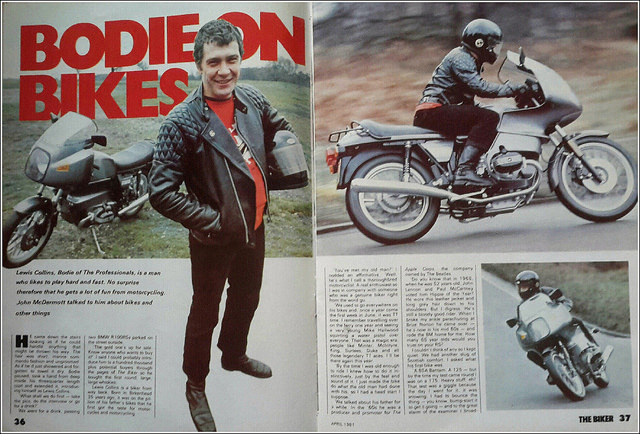 mmmm yes he does look goid (gorgeous even) in biking leathers and Lewis and motorbikes go hand in hand. Thankyou, i'm glad that you like it and thankyou for looking. Lewis, black leather .. mmm sorry, did you say something? mmmmm seeing Lewis in biking leathers does have that affect on me...it kind of brings me to my knees . Oh my!... How good he looks in leather and biking gear!?! Thank you so much for delighting us every day with these wonderful (and often unseen before, at least by me 😆) Lew pics! mmm he looks so good in his biking leathers and you are very welcome, i always enjoy reading your comments and am always grateful to receive them. Another one that's new to me, thanks. He always looks so happy on a bike.